Not exactly a bikini in a burqa, as the name would suggest, the 'Burkini' has been designed combining beachwear, with ladylike Islamic modesty in mind. Russian fashion designer Dilara Sadrieva talks about the seven essentials of the burkini swimsuit for the discerning Muslim woman, planning quality beach time. The Burkini (from burqa and bikini) is a swimsuit for Muslim women, designed by the Lebanese-Australian designer Aheda Zanetti in the early 2000s. The uniquely designed modest swimsuit is becoming increasingly popular with Muslim women in Russia. Dilara Sadrieva, a Russian designer specializing in Muslim women’s fashion, provided tips for choosing this important article of mostly vacation clothing. 1. Ideally, a burkini must be water-proof, or quick drying, and should protect a woman from UV rays. Really good burkinis are made from the same materials as clothing for surfing. 2. 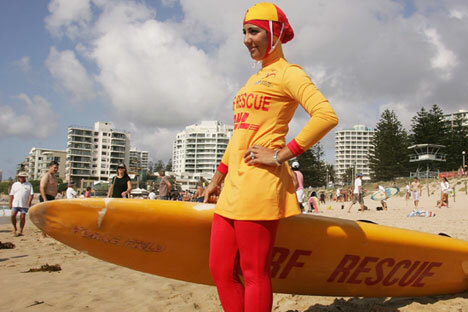 It is important to remember that swimwear for Muslim women is not only limited to a burkini. A wide range of extravagant beachwear exists that is in consonance with modesty and Islamic values. 3. The kind of burkini a woman chooses depends on the activity she plans to participate in. A whole range of different burkinis is available, for those who plan to swim, or dive, or take part in water sports or relax on the beach. 4. A Burkini should allow a woman to swim freely. It should not be very tight-fitting or stick to the body after swimming. 5. There are Burkinis that look more like tracksuits and are very heavy when wet. 6. The hemline needs to be attached to the pants from the inside, so that it isn’t pulled up while a woman swims. 7. Instead of using a headscarf made of synthetic materials, which is sold in a Burkini set, it is better to use a natural crepe de chine scarf, which dries faster and protects the hair better.